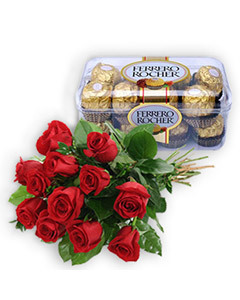 Exclusive Combo of 12 Red Roses Beautifully with 16 Pcs Imported Ferrero Roccher Chocolate Box - Send this exclusive gift to your loved ones through us. Roses 60 cm. Home :: Sentiments :: Love & Romance :: Bouquet "Baby Loves You"